Swan paddle boat is a leisure boat for fun, it is a popular water amusement ride for people which combines sports, entertainment with leisure. Sometimes we also call it the swan pedal boats. It is different from the duck pedal boats. Grand and realistic appearance, high stability has made the whole set of boats splendid. People could wandering in the river with driving this comfortable pedal boat. We can usually see them in the amusement parks. Some of them are made of fiberglass which others are made of engineering plastic. Size of the swan pedal boats could be changed. 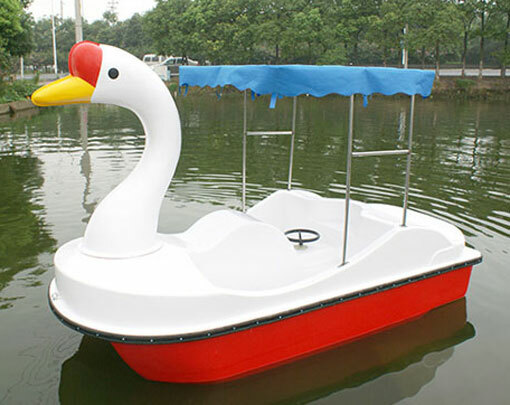 Swan paddle boat is an indispensable water ride for amusement parks. When amusement park owners decide to start an paddle boats business, they have many choices, they can choose the electric paddle boats, hand paddle boats, water bumper boats, but they can also choose the swan paddle boats, these boats owns novel design, realistic appearance, when people riding on these boats, they will have a feeling that they are riding on a real swan. It must be interesting for kids who love swans. Additional, speed of the boats could be controlled by riders, they could drive these paddle boats freely. The working principle of paddle boats in the amusement park is to the action and reaction, backyard by forward kicking the hull rear wheel and then keep forward by this reaction force. Some of the swan paddle boats are manually, while others are electric, for hand swan paddle boats, riders should pedal the boats with their boat and control the direction by hands. The manual pedal boats is working just like the bicycle we ride usually, but the difference is if you need moving forward, just pedal it forward, if you need to backyard, just pedal in the different direction. It is very easy to operate. Fadeless material which will prevent the color from fading. Size and color of the swan pedal boats could be customized. All of our pedal boats are made of quality FRP which will guarantees the durable quality of the products. Most of the swan paddle boats are used for small ponds in the amusement parks, water theme park, some of them even used for weddings, a water theme wedding in the swan pedal boats must be romantic and unforgettable. Additional, most of riders on swan paddle boats are kids, so requirement on the safety elements is very high, so when you need to use the electric swan boats, check it carefully, kiddies are actively, they like moving, so body of the boat should be flat, and the armrest should be sturdy. 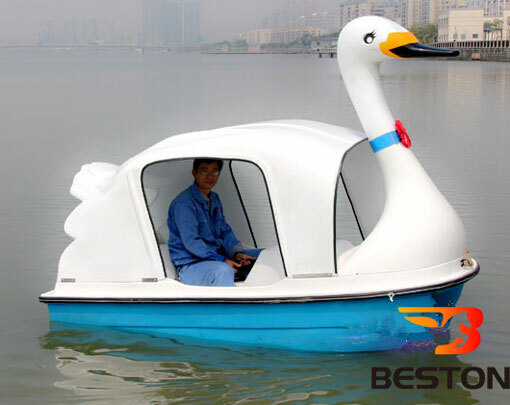 Beston is a wholesale swan pedal boats manufacturer with lower price, Our swan pedals has exported to many countries, such as Singapore Malaysia, Greece and so on. Because of its novel style, our swan boats has got lots of praises from our customers. Give us a opportunity, we will provide you quality swan pedal boats and all round post-service. 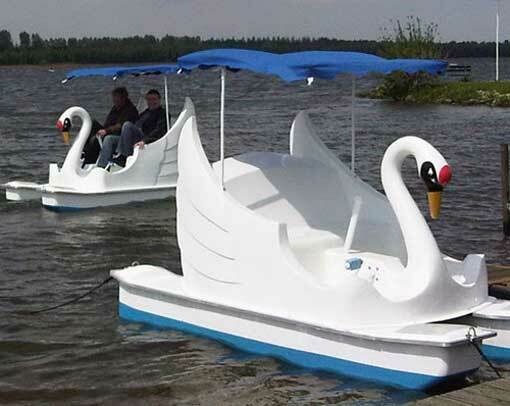 Note: Different swan pedal boat has different parameters, number of seats, size. 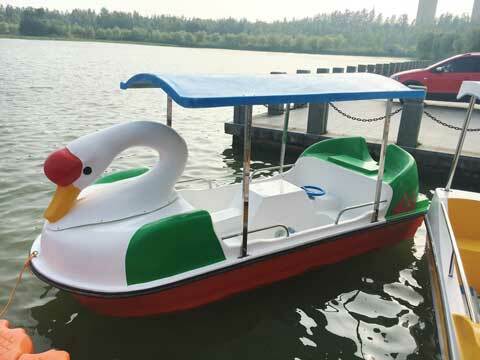 So when you send your inquiry, please tell us your requirement on these items and we will send you the suitable So please tell me your requirement and application, we will show you the swan pedal boat which is suitable for your water business.